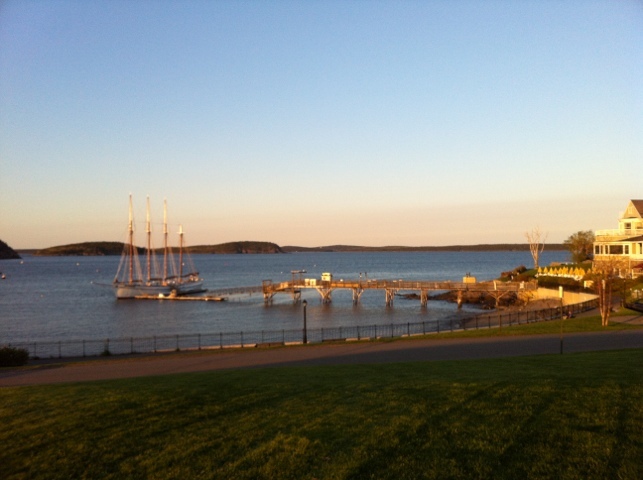 I was recently up in Bar Harbor, pronounced “Bah Hahbah” if you’re a true Mainer. I’m not as I was told repeatedly by “real Mainers” as a child. I’ll never forget when I was a kid talking to someone that frequented the restaurant I worked in. When they found out I was born in Washington DC and moved to Maine at age 3, they said something to the effect of “DC! Umph…so you’re from away.” Apparently if you’re not going to be born in Maine, our nation’s capitol is NOT second best. Anyway….I was in Bar Harbor and was directed to Lompoc Cafe by a friend who writes for the local newspaper. A favorite of mine is Cafe this Way, but they had a private function that night. And I’m glad they did, so that I could try this adorable bohemian spot just off the main street. First off, half the restaurant is outside with tables step up around an old tree. May have been maple or oak…I admittedly don’t know my trees that well, other than pine trees of course! Along side the dining area is space to play bocce, in which a very lively game was being played by 20 somethings sipping on local beers from the tap. I was there for business and was pleased to beat the tourists who generally show up in droves after Memorial Day…you know those “people from away”. I had a fresh, local, vegan (although lots of meat available) and very inexpensive meal in a delightful atmosphere, with plenty of people watching opportunities (something I always like). Starter was a mixed green salad with sweet radishes and celery, then on to felafel burger with a side of hummus, house pickled cukes and sauteed Maine fiddleheads (only another week or so for those). And a margarita if you’re looking closely at the photo. Then on the way back to the hotel, (the Harborside a very nice place with cheap rooms during off season) my coworker and I took in the sunset across the bay. If you’ve never been here, you should go sometime. The island is called Mount Desert and is home to Acadia National Park where you can climb Cadillac Mountain to see the first rays of sun hit the east coast of the US. The carriage trails are great for biking and trail running and the ocean scenery is amazing.